The whole “Who will Floyd Mayweather fight on 5/5?” saga gave us more suspects than a game of Cluedo but like all ‘who dunnit’ games, all is revealed eventually. We sat through talk of Colonel Pacquiao, Professor Bradley, Dr Alvarez and Professor Guerrero but finally we've had our moment of clarity; Floyd Mayweather will fight Miguel Cotto. I like this fight, I mean Pacquiao was the number one option, but did you ever think the fight was going to be signed? I know I didn’t. A few days ago it was looking like Mayweather would fight red-haired Saul Alvarez, but this sucked. Alvarez is too green and his only chance to beat Mayweather would be a lucky punch early in the fight. A lot of fans had Cotto as a better option. Well the fans got what they want, and it is the best fight that could come out of a bad situation. Not everyone was happy though and it was only a matter of time before a Pacquiao fan cried out “He’s fighting our boy's leftovers!” They have a point, but it's a small one. Pacquiao looked excellent beating Cotto in 2009, but he made him jump through hoops by fighting at a catch weight. So while Pacquiao fans can say “We already beat Cotto”, Mayweather fans can reply “True, but we're fighting Cotto at a better weight.” Actually, that sounds a bit too cordial for an exchange between Pacquiao and Mayweather fans, but you get my point. If Mayweather dominates and stops Cotto without receiving much punishment then the Mayweather fans will have a right to be smug. I want Cotto to win, but when I bring myself back down to earth I know this fight has ‘Mayweather victory’ written all over it. Cotto was stopped in his losses to Antonio Margarito and Manny Pacquiao, so a Mayweather TKO win is something to think about. Cotto also struggled against a great defensive fighter in Joshua Clottey, a guy whose defence doesn't approach Mayweather's. If you held a gun to my head and asked me if Mayweather will win on points or on a stoppage, first I’d say you're overreacting by pointing a gun to my head. Then I'd tell you Mayweather will get a stoppage late in the fight. 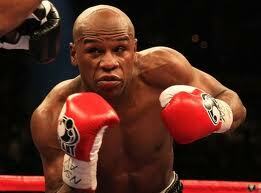 Punchbag Blog picks Mayweather to win by late stoppage. It’s a best of a bad situation-type bout, but maybe we should just enjoy Mayweather’s fights while they last instead of banging on about the Manny-Floyd saga. Time flies you know, and before you realise it Floyd Mayweather will be retired.